At peter Cross Preservation, we are keen to prevent properties from water and wood insects, keeping it safe and secure. As well as prevention, we also offer eradication services for wet and dry rot, mould and fungal treatment, woodwork treatments, installation of chemical damp proof courses and electro osmosis damp proofing systems across Merseyside & Chester. All of whom are members of the British Wood Preservation and Damp Proofing Association (B.W.P.D.A). See below for details on different types of preservation. For more details on damp proofing, wood treatments and the prevention of mould in Merseyside or Chester, please get in touch with a member of our professional team by calling 0845 0505 343 or request a call back. Alternate options are also available on our contact page. Woodworm is a very serious problem in all wooden objects and should not be taken lightly as it can not be killed off that easily. Woodworm can damage properties and if not treated cause major structural damage. The natural habitat of woodworm is very damp and if the content of the wood is lowered then the area becomes inhospitable to insects. Woodworm, also known as a wood-boring insect and often referred to as a Common Furniture Beetle can cause all kinds of problems and each have their preferred materials to bore into. The Death Watch Beetle prefers older, rotten woods such as Oak. Whereas Powder Post Beetles like new, hard wood and the Wood Boring Weevil has a diet of soft, damp woods. House Longhorn Beetles are very rare in England and generally found in the South of the country. Treating wood-boring insects varies between the different types of beetles but all comes down to interrupting their life cycle. Adult beetles lay up to 60 eggs, which are injected into the timbers open pores. Softer, sawn wood is most preferred due to the structure of the pores. Once hatched into larvae, they will eat at the wood for around 3 years, then emerge as an adult. Adult beetles live for about 6 weeks and die after laying their eggs. It is unlikely that they will attack wood which is younger than 60 years old, unless they have been introduced into the property through already affected timber. In the UK, the most common wood-boring insect is the Common Furniture Beetle, which has a liking for seasoned timber. After the adult has laid it's eggs in the timber, they will hatch around 3 - 4 weeks later into grubs, which will bore into the wood for 3 - 5 years and emerge around April or May through the small, round holes - typical of this type of beetle. Wood Boring Weevil (Euophryum confine) will attack only after a timber has been pre-digested by a wood rotting fungi. The House Longhorn Beetle has become more common in the UK over time. This is a larger type of beetle which can live for up to 8 years. Due to it's considerable size - up to an inch - the House Longhorn Beetle can do a lot of structural damage. Death Watch Beetles tend to attack old, hard wood such as oak beams. 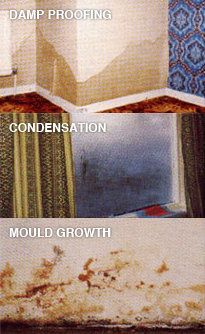 The basic symptoms of damp, such as peeling paint, are normally the same no matter how the dampness was caused. However, different causes of dampness require different methods of treatment. Rising damp in buildings may be defined as the vertical flow of water up through a permeable wall structure, the water being derived from ground water. The water rises through pores (capillaries) in the masonry. In other words the masonry acts like a wick. Dry and wet rot are the common terms for decaying timbers. This can be caused by many factors but the most serious is fungal decay. Wood rotting fungi, more commonly known as fungal decay, is spread by microscopic spores in the air. This fungi easily germinates when coming into contact with damp wood, creating tiny filaments which get into the wood. Once settles in the timber, they release chemicals into surrounding timber. The decay of the wood is caused by the chemicals dissolving nutrients in the wood, the nutrients arethen absorbed by the fungal hyphae, enabling the growth to take place. If the moisture content is high enough the growth extends through the wood via a network of fine threads called mycelium. The Dry Rot fungus is serious and causes decay mainly in conditions of high humidity and restricted ventilation. The mycelium is white in color and has a woolly texture to it. There may be patches of bright yellow or pale purple where exposed to light. If the growth is in a less humid environment there will be a thin gray skin over the growth. The strands will be white to gray in color reaching the thickness of a pencil. The fruit body, usually on the wood or wall joint, is normally in a tough pancake shaped with a yellow centre when young, darkening to a rusty red when mature which is the spore production faculty. The margin may be in a white or gray color. Size ranges from 5cm to 30cm. The spores may be in great numbers and settling in a fine reddish brown dust throughout the contaminated areas. True dry rot (Serpula lacrymans) is the more dangerous fungi because of its ability to move sometimes far beyond its water source. Usually identified by its large fruiting bodies and a mass of white threads. Sometimes called cellar fungus (Coniophora puteana), wet rot is not as serious as dry rot but can still be a cause of structural problems. Wet rot is caused by excessively damp timbers with a high moisture content usually assisted with poor ventilation. Wet rot will attack all soft and some hardwoods. Wet rot is caused by a number of fungal species, which require remedial treatment. Bleaching or darkening of the wood are normally good tell tail signs. Some species are only found in specific areas or buildings. Fungi feeds on dead timber, changing the colour and weight and eventually breaking down. Cellar fungus, recognised by dark brown threads on the surface of the wood, is highly common and occurs in very damp areas. Cellar fungus is the most common type of wet rot which occurs in damp areas, noticeable by it's dark brown strands, which spread over the surface of the wood. Wet rot is generally treated the same, no matter what species it is. However dry rot is treated in a number of ways and it is therefore vital to determine which species it is before eradication begins. Waterproofing of existing cellars and basements is becoming increasingly popular as property prices increase. By converting a basement, you will not only gain extra living space but also the value of your property and is a much cheaper option than moving house. You can convert your basement into a guest bedroom, games room, cinema room, study or wine cellar, the options are endless. For commercial properties, conversions normally consist of car parks or additional storage space. Tanking (Basement / cellar waterproofing) is the application of a fully waterproof membrane placed over masonry, normally underground, to ensure that no water or dampness can penetrate into the room, even under high pressure. Cavity wall ties are installed during construction, can be of slate or steel and are used to 'tie in' the elevation to give structural stability. Rusting of ties or lack of ties. Fishtail Ties - Corrode and expand causing bulging to brick work and horizontal cracking to mortar joints. Mild Steel Butterfly Type - Corrode away to nothing leaving the property unstable. Slate Ties - They do not conform to current Building regulations and can cause bulging to the brick work. New wall tie installations are Stainless Steel so corrosion is no longer a problem. Wall tie corrosion can occur in properties built pre 1980's. Not all older properties have a corrosion problem but it does mean older properties are theoretically at risk and should therefore be inspected.